Highfield unit and Wenrisc ward artwork, based on feedback and drawings from patients. 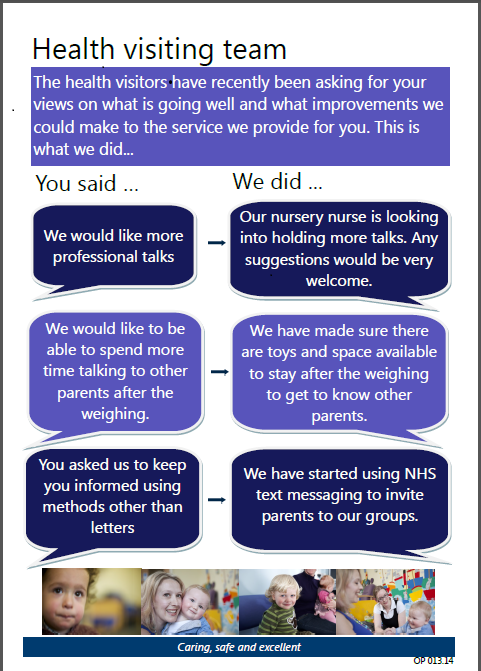 Every day across the Trust, we aim to change things, both large and small, as a result of your feedback. 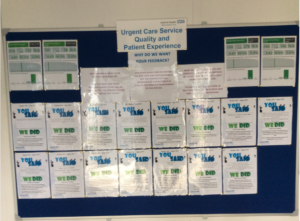 Look our for our ‘You said, We Did’ posters, notice boards and newsletters, which show how we’ve made changed things based on feedback we have received. Please don’t hesitate to let your main worker, a team member or manager know if you’ve got feedback and suggestions, or find out more about leaving feedback online. We now have joint Child and Adolescent Mental Health Services (CAMHS)/Adult Mental Health Team (AMHT) transition forums for Buckinghamshire and Oxfordshire. The purpose of these forums is for health care workers to plan early for people who are coming up to 17.5 years old, and who will therefore be moving from children’s to adult mental health service. A joint CAMHS/AMHT services commissioner is in the works for Buckinghamshire. Staff supervision in CAMHS now includes keeping track of who is coming up to 17.5 years old. Our new Service Director for adult mental health services brings extensive experience and knowledge of managing children’s services. The transition from children’s to adult services is challenging, and we recognise that there is more work to be done.